And the winners of the 2019 CREATE Symposium are... - New York State Industries for the Disabled, Inc.
What a fantastic day! 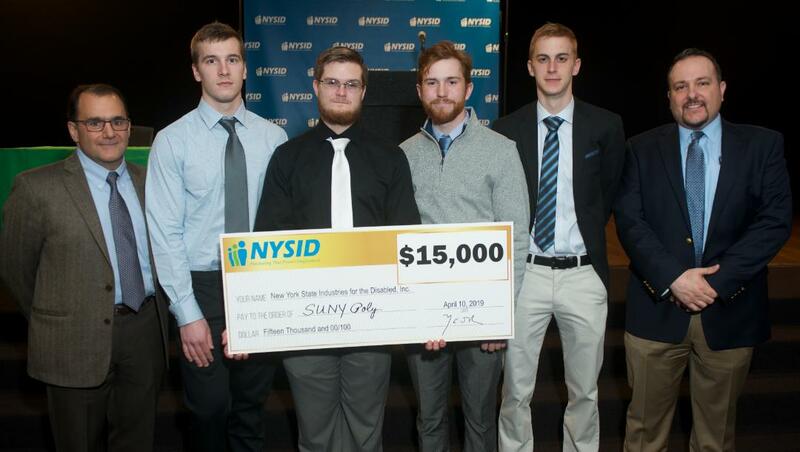 On Wednesday, April 10, NYSID hosted the 2019 CREATE Symposium at the Empire State Plaza in Albany where NYS college engineering students collaborated with NYSID Member Agencies to develop inventions that help improve the vocational lives of workers with disabilities. The day kicked off with an impenetrable buzz as the room filled with purpose and possibility. From robots to virtual reality devices and beyond, student engineers applied their brilliant minds to making a difference for people with disabilities at 11 NYSID Member Agencies across the state. This year was the biggest and best ever CREATE program, with a record 21 projects developed to help individuals with disabilities get to work and do their jobs better. For a complete list of projects, click here. Judges from the business, technology and rehabilitation sectors observed each project and singled out those which demonstrated obvious impact on how people with disabilities work. Prizes were awarded to the top three scoring teams with prize money totaling $30,000 on the line. Prize money for each winning team was split among the student engineers (50%), the participating college/university (30%) and the participating NYSID Member Agency (20%). Congratulations to all of the winning teams and a HUGE thank you to all participants for helping improve the lives of workers with disabilities! See below for a complete list of media coverage from this year’s event.